1. It’s a situation comedy with no intention of being funny. 2. It was never actually broadcast on television. 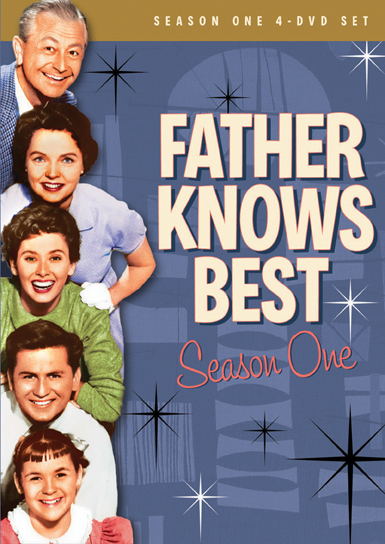 In 1959, the U.S. Department of the Treasury approached the producers of Father Knows Best about filming a special episode of the series that would promote the sale of United States savings bonds. Their request was granted, with the AFL-CIO union covering production costs, and the actors donating their time and talents. 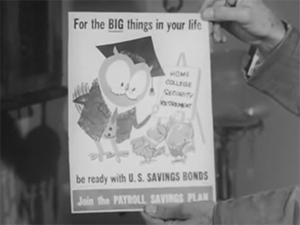 The finished episode was distributed to schools, churches and civic groups, to encourage viewers to buy bonds as a sound investment, as well as a way to protect the nation from foreign enemies. Such a scenario could never happen now, another reason this episode is so interesting to me. If any department of the federal government tried to get a pro-patriotism message out to the public through a television show, it would immediately be distrusted and dismissed by half the population. Its cast would be condemned for taking sides, and its network and sponsors would race to see which would be first to issue a carefully scripted apology. 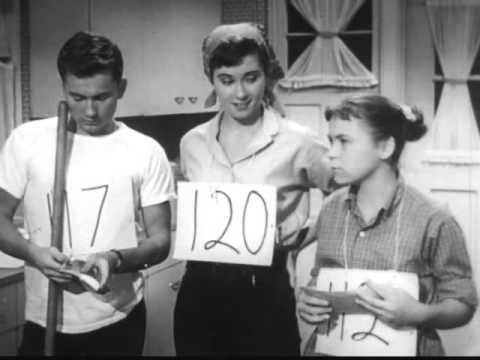 For decades, “Twenty-Four Hours in Tyrantland” was considered a “lost” episode that few viewers were aware existed and even fewer ever watched. But that changed in 2008 when it was included in Shout! Factory’s DVD release of the series’ first season. When I first watched it, based on the little I had heard, I expected some shallow piece of propaganda, with dire warnings of the Communist threat expressed in fevered tones reminiscent of Reefer Madness. I should have known better. The episode was written by Roswell Rogers, the series’ most talented and prolific scripter. He wasn’t capable of hackwork, and he got the story’s message across without pushing any of the Anderson family to act differently from their established characters. I found it to be compelling drama, and not just because Russia is back in the headlines every day. The story opens with Jim (the ever-engaging Robert Young) arriving home with an exciting announcement: he’s been asked to head up Springfield’s savings bond campaign, and he’s eager to recruit his family into the endeavor. "We have to convince every family in town, even the kids themselves, what we Andersons already know about bonds," he tells them. But while his wife Margaret is ready to help, the kids are predictably less than enthused. Bud was already TV’s prototypical teenage slacker, Betty’s highest priorities were usually boys and a new formal for every dance, and little Kathy was always self-centered. Bud responds, "How much you wanna bet?" And that gives Jim an idea. If the kids endure 24 hours under tyrannical rule, they’ll each win $18.75 (over 100 bucks in 2019 money) to spend any way they want. If they lose, they’ll have to spend that money on a savings bond, and help Dad with his campaign. The kids jump at what appears to be a cinch bet – they have no idea the lengths to which good ol’ Dad is about to go to prove his point. The children are given numbers instead of names and assigned household chores. Bud has the morning newspaper ripped from his hands (“You only read what we want you to read”). Eager to get back to their carefree regular lives, Bud and Betty plot an escape. But Dad had monitored their phone calls (like the secret police would in a totalitarian regime). As punishment Bud is exiled to the garage and given a dinner of crackers, water and one cube of sugar. I always wonder when to stop with the plot points, so anyone interested can discover this episode’s pleasures without too much spoiling. I’m also aware that my descriptions of the trials Jim puts his kids through may lack the gravitas of seeing them imposed. This is not just another sitcom story. There is no humorous undercurrent to the children’s plight, or to the parents’ authoritarian rule. When Bud offers a sheepish “Thanks, Mom” for the crackers she delivers to the garage, it’s unsettling watching Jane Wyatt turn and announce, “I am NOT your mom.” Though she feels a twinge of conscience afterward. Are you shuddering yet, Jim? As the clock ticks toward the 24-hour time limit, it seems as if the kids are going to win their bet. But Jim has one more revelation that crushes the resistance once and for all. It is brilliantly played. Betty’s quiet “I give up” has a resignation meant to resonate with any viewer that takes the blessings of America for granted. 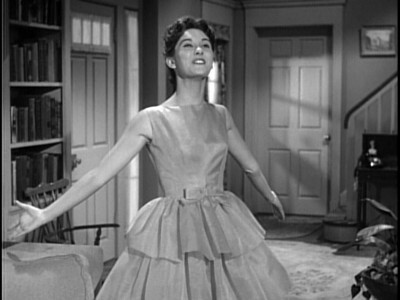 As in episodes like “The Bus to Nowhere,” this is a Father Knows Best episode that dares to confront real-world circumstances rarely acknowledged in escapist entertainment from the 1950s. Maybe “Twenty-Four Hours in Tyrantland” would seem corny to Millennials. But that’s probably how they’d react to any Father Knows Best episode. The world has changed so much since then – for the better in some ways, regrettably so in others. But so what? This was a show written at a time when no one would have anticipated there would be interest in Father Knows Best 60 years later. It was directed solely at a Cold War audience that had watched the Soviet Union invade Hungary, and heard Nikita Khrushchev openly and repeatedly threaten the West with nuclear annihilation. What could someone living in a quiet Midwestern town do to prevent such a catastrophe? Buying a bond wasn’t going to reduce Soviet aggression. But perhaps it was a way to feel a little less powerless. I first read about this special show in Brooks & Marsh's book about primetime tv back in the late 1970s, so I've known about it for years. I only finally had a chance to watch it on YT in the last year or so. While quite a few comments were positive, I was disappointed to read a few comments from the modern day SJW crowd, who decried the show in general and specifically here for its pro-US stance.